Sometimes the cattle on the farm by our house are quiet. On other occasions, they are so vocal that I wonder what is going on. Being a person who is fascinated by the animals that God has created, I rather enjoy the "moos" that I hear from time to time. It doesn’t bother me a bit. Even though they do not belong to me, I am glad they live nearby and I care about their well being. 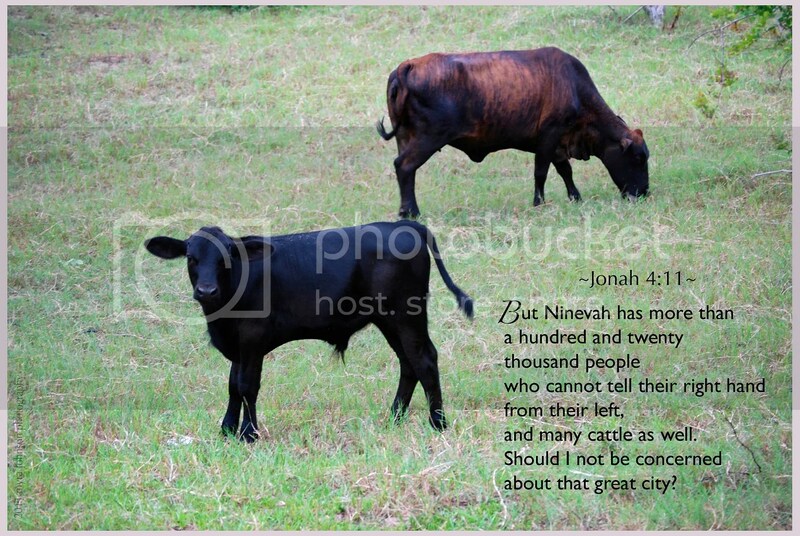 In the Old Testament book of Jonah, God shows His great concern for those who live in a great city—Ninevah. God sent Jonah to preach to the people. When Jonah brought God’s warning to them, they repented. It would seem that he was truly angry that the people had turned from their evil ways and believed God. God cared about the people in Ninevah. I think God also cared about the cattle. All life is important to Him. He didn’t leave those who could not "tell their right hand from their left" to perish in their sin without giving them an opportunity to repent. God cares about the cows that live beside me. He cares about the people in my neighborhood. He cares about the people I work with, week after week. Since God cares about them, shouldn’t I? North face jackets sale at discount price! Pick now! He didn’t leave those who could not “tell their right hand from their left” to perish in their sin without giving them an opportunity to repent. Beginning the process of new life, probably sitting in the window sill to the left of all the desks, the warmth and sunlight from the outside nurtured the bean.